(Newser) – Higher prices on McDonald's menu led to surprisingly strong comparable-store sales during the first quarter, sending shares up sharply Monday. The company worked to grow its US business with new initiatives, like swapping out frozen beef patties for fresh ones in its Quarter Pounder burger. It also launched a new value menu earlier this year, reviving its once-popular Dollar Menu, but with items priced at $1, $2, or $3. The idea is to get people in for cheaper items who then upgrade to pricier ones, per the AP. Sales rose 2.9% at established restaurants in the US, the company's biggest market. Worldwide, that figure rose 5.5%, which is a lot stronger than the 3.6% increase that industry analysts had forecast. "Diners now see the value options as a permanent fixture and are no longer as excited or stimulated by them," an analyst at GlobalData Retail tells CNBC. "Indeed, some diners initially attracted by the deals are visiting far less often." McDonald's earned $1.38 billion, or $1.72 per share, for the period ended March 31. A year earlier, the hamburger chain earned $1.21 billion, or $1.47 per share. Adjusted earnings came to $1.79 per share, which is way better than the per-share earnings of $1.67 that industry analysts had projected, according to Zacks Investment Research. 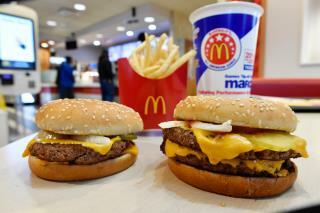 Shares of McDonald's Corp. rose more than 5% to $166.55 in early trading. Went to McDonalds at a resort in Vegas several weeks ago. A big mac meal was $15. Now it was a pleasure going to White Castle at Casino Royale. It was around $12 for the meal of 4 sliders, onion chips, and a drink. And when I said, "onion rings" the lady corrected me to say "onion chips" because that's what they have. And then I remember how greasy they were. But before I left, I had their chocolate covered cheesecake on a stick. What is that orange-yellow goop on top of the "meat"? Instead of screwing around with their prices they should consider doing something with their insipid food.